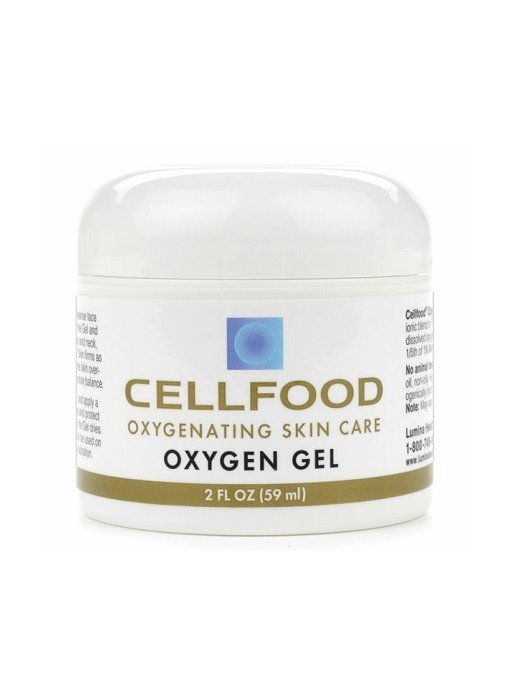 Cellfood Oxygen Gel is the ULTIMATE skin formula. Lumina Health has utilized specific high quality ingredients— each one known to be an exceptional skin rejuvenator— to create a skin gel that is both beautifying and healing. Cellfoof Gel Is effective for all skin types. Use it for all problem skin areas: wrinkles, lines, stretch marks, rashes, sun spots, veins, bruises, rough skin, skin damage, and all skin blemishes. It contains 78 ionic trace minerals, 34 enzymes, 17 amino acids, electrolytes and dissolved oxygen. But what makes Cellfood especially unique is its ability to 'dissociate' water molecules— weakening their bonds and releasing vital oxygen and hydrogen. This ability to release cascades of these precious building blocks of life has made Cellfood one of America's fastest-growing nutritional products today. For persistent conditions: You may add 1 or 2 drops of original Cellfood Drops to the Oxygen Gel for special skin problems. Don't add it to the jar— rather, mix a drop or two into an individual application of Gel. You may use cap for mixing. Gel will become more liquified, and will penetrate your skin's cellular tissue with enhanced oxygenating power. The Award wining Cellfood Gel is the ONLY replenishing skin gel with the revolutionary Cellfood, cell-oxygenating formula. With your very first use you'll feel the gel refresh, tighten, and smooth your skin, as it oxygenates and moisturizes all day and all night.